This is a video where we show a summary of our work during the last 3 months and our plans for the future. a- Merchant adoption: We must have the merchants first in order to people can be able to spend their Dash. b- Get Dash into people hands: Once we have the merchants now is time to fill the economy with Dash, in that way people will have Dash and they will also have options to spend it (merchants affiliated in Stage 1). The best ways to bring Dash into the economy is throught Remittances, Freelancing and Mining. We are working in a remittances project for this. 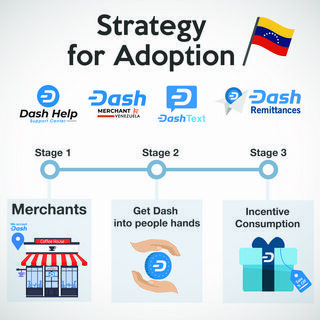 c- Incentivizing the consumption: At the same time we affiliate merchants and we bring Dash into Venezuela, we have to give people good reasons to spend that Dash rather than exchange it to Bolivares. We can achieve this using discounts, special promotions, Dash Back, loyalty programs. 2) WHAT WE HAVE DONE? 2.3) DashText.io website ready. In our website anyone can learn how to use Dash Text, there are all the commands, instructions and FAQs. 2.4) Integration with Dash Help. Dash Help is the official support center of many Dash projects, and Dash Text is not the exception. 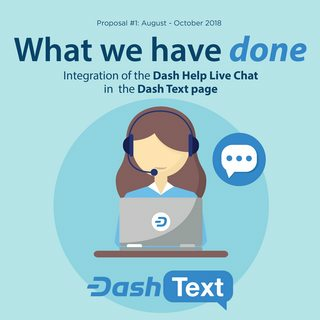 So we did the integration of the Dash Help livechat in the Dash Text site, in that way anyone can have live support from our agents, learn even faster how to use the system and solve any kind of issues very quick. 2.5) 1000 wallets created! 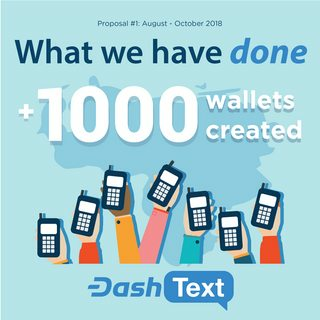 It has been only couple of weeks (14 days) after the launch and we already created over 1000 wallets on Dash Text (without a big promotion yet). We have heard and read from people that creating and using a Dash Text wallet is even more easier than using a regular wallet, the only thing you need to do is send a SMS to the number 2030 and that's it, no internet required, no downloads and no smartphone required neither. 3.2) Whatsapp and Telegram integration for Remittances. 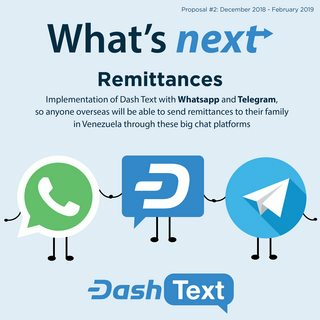 Dash Text's ease of use and simplicity makes it the perfect solution for Venezuelans overseas to send remittances back home, to do so, we will enable Dash Text functionality in both Whatsapp and Telegram, which are the biggest chatting platforms Venezuelans use, this way, Venezuelans in any country in the world nwill be able to send Dash easily back to their family and friends in Venezuela. 3.3) SMS shortcodes activation in Africa and South American countries. 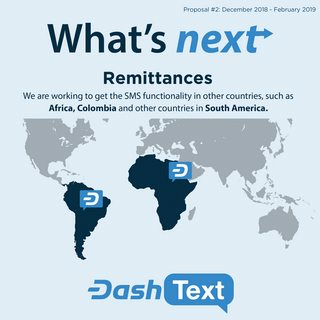 Besides the Whatsapp and Telegram integration we will start working on getting the SMS functionality activated in other countries like Colombia and in Africa, so Dash Text can be used by anyone around the world. 3.4) Marketing work. We will keep promoting the Dash brand and all its solution like Dash Help, Dash Merchant and now Dash Text. As said above, people is saying that using Dash Text is even easier than using a regular wallet, and this is the way we will promote it. The goal of Dash Text wallets by the end of 2018 is 10,000. Thank you very much for reading our proposal, please let us your comments of questions, we will very happy to answer you all! I think it would not be unreasonable to "pause" the proposal for a month until we can have a fuller discussion and sort out all the repercussions and consequences of the most recent DashWatch proposal. If it sorts out ok, I would happily vote yes next month. LORENZO REY AND ALEJANDRO E ARE SCAMMERS AND CONMEN. 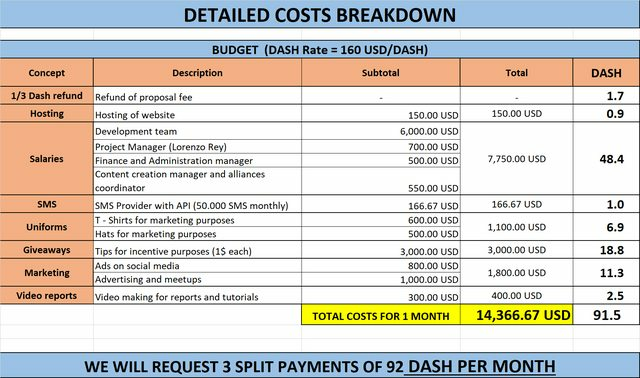 DEAR MNO COMMUNITY - PLEASE READ THE LATEST REPORT FROM DASHWATCH - DASH MERCHANT VENEZUELA WAS SET UP TO DEFRAUD THE DAO AND HAS EMBEZZLED AND STOLEN/MISAPPROPRIATED OVER 64,000 USD OF PROPOSAL FUNDS TO DATE. THEY RECENTLY ATTEMPTED TO DECEIVE DASHWATCH BY PROVIDING DOCTORED RECEIPTS WHICH THEY PROVIDED AFTER THEY WERE QUERIED ON THEIR FINANCIALS THAT SHOWED MAJOR DISCREPANCIES (AND THESE NUMBERS WERE FOUND TO HAVE BEEN COMPLETELY MADE UP). THEY ALSO HAVE ADMITTED TO THE FRAUD TO DASHWATCH - THIS TEAM, THEREFORE BOTH LORENZO REY AND ALEJANDRO ARE CONMEN AND LIARS, AND HAVE BEEN DEFRAUDING THE DAO. PLEASE READ THE REPORT AND DEFUND THIS FRAUDULENT PROPOSAL. THE REPORT SPEAKS FOR ITSELF. TO MEMBERS OF THE COMMUNITY THAT WERE FOOLED BY THIS PROPOSAL AND TEAM - IT IS NOT YOUR FAULT, THIS WAS A SOPHISTICATED CON, THEY USED TECHNICAL MEANS TO ATTEMPT TO DECEIVE DASHWATCH, AND WERE ONLY FOUND OUT BECAUSE OF THEIR PERSISTENCE. THEY POSTED UP HOPIUM VIDEOS THAT COST VERY LITTLE TO PRODUCE, AND WERE FABRICATED AS A CONFIDENCE TRICK IN ORDER TO MAKE THIS A LONG-TERM CON. THIS IS LIKELY NOT THE ONLY DAO PROJECT THAT IS FRAUDULENT, PLEASE READ DASHWATCH REPORTS AND INSIST ON ACCOUNTABILITY OF PROPOSALS. Scammers and conmen? Get real. They have provided a lot of value and put a lot of genuine effort into their work. They made a serious mistake and as a result they (and the Dash community) will suffer the consequences. But to call them scammers and conmen, after all they have done, is just laughable. They are scammers and conmen, the both of them. FACT - read the latest DashWatch report on Dash Merchant Venezuela, and understand that these are the same guys. That the DAO continues to give funds to those that scam and embezzle (ie Lorenzo Rey and Alejandro) would be the laughable thing, especially since they were just days ago busted for it, if it wasn't so bloody sad. Wake up MNO's - stop giving the scammers more money! Thank you for demonstrating the importance of short codes. I'm not sure how others can justify it here yet not for Blockchain Users. Hello GrandMasterDash! Thank you so much for your support! Congratulations! For me this is one of the most important Dash projects for mass adoption. You have my support! Thank you so much for your support ash! The problem for Venezuela isn't "sending" Dash. It's having it in the first place. 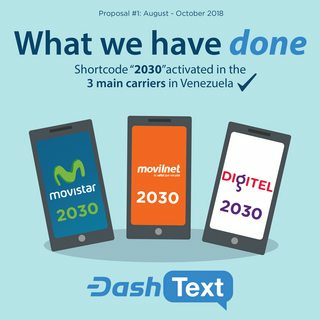 Hello roger, 60% of Venezuelans without smartphones couldn't get or use Dash even if they wanted to, Dash Text gives them the opportunity now, yes getting Dash into people's hands is important and we're working on it as you can see in the proposal, and Dash Text helps greatly with that. Hope to get your support and thanks for commenting. There is a small but yet important population of smart phone users that always seems to be forgotten when it comes to apps. We are the underserved Windows phone users! There is no Dash wallet for Windows phones! 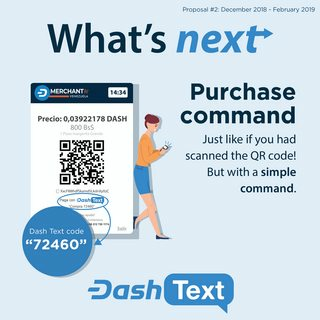 Give me a glimmer of hope and tell me that you plan to have Dash Text available in the U.S. by next year! Hello nerdmoney, I completely agree, windows phone users will be happy to know they can now use Dash on their phones through Dash Text. As you can see in this proposal, we will enable Dash Text to work with Whatsapp and Telegram so very shortly you will be able to use Dash on your Windows Phone. The SMS functionality is something we want to enable in the US as well but it will likely take a few more months. I have voted YES. Lorenzo, can we do a video of you receiving a payment from the website dash.red? That would be helpful for the both of us!!! Hello Edward! Absolutely lets do the video, let's talk in private to coordinate and make this happen, thank you so much for your support, we're sure dash.red users will love Dash Text. easy YES. Broadening the reach to those who shy short of Smartphones in countries where the funds can potentially make a real difference to peoples lives. Let the development continue. Thank you so much for your support Criticalinput! First of congratulations on your accomplishments. Don't get me wrong I like Dash text but I am yet 100% sure expanding Dash text to various other platforms, despicably seen that Dash text is aimed at users that do not have smartphones. Whatapp en telegram only work on smartphones as far as I know. Is there an website with an overview of all the possible functions that can be done by users ? Both the functions and the user-processes would be interesting to take a look at. *Don't get me wrong. I like Dash text but I am NOT yet 100% sure expanding Dash text to various other messaging platforms, especially seen that Dash text is aimed at users that do not have smartphones. Whatapp en telegram only work on smartphones as far as I know. 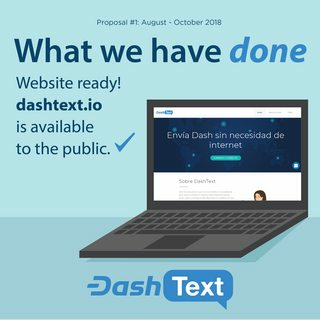 All the details about the use of Dash Text are in the instructions section of our website www.dashtext.io, it is currently in spanish only, and also in our social media channels @DashText (IG) and @Dash_Text (TW), where we consistently talk about the features and how to use the service. Regarding the question about Whatsapp and Telegram. Dash Text is of course a wonderful tool that brings the ability to use Dash to people without smartphones, and that was the main reason why it was conceived. However Dash Text is also the easiest way to get anyone into Dash, you can easily tip someone without them having to download anything, and when they get the money they're always impressed and want to learn more. So we don't really want to confine Dash Text as a feature-phone service only, it is open to anyone with any kind of phone. We are planning to expand the SMS service to other countries, but that is a slow process that has to be worked out country by country. 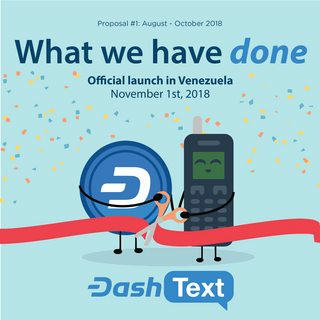 We didn't wanna have to wait so long to provide this service to more people, one of the big challenges at present time is getting Dash into people's hands in Venezuela, and remittances is one of the most important ways to do so, so the motivation behind the Whatsapp and Telegram integrations is to get Venezuelans living overseas (who mostly have smartphones) to be able to get into Dash quick, and be able to send Dash to their families in Venezuela though Dash Text. We understand that it could be confusing to some people, and we're going to be very careful in the way we communicate this so that people understand everything clearly, it is a challenge for us and we are excited to see how it all plays out and hopefully get many Venezuelans abroad to send remittances back home easily. Thanks again for your support and for asking good questions, I'll be happy to answer any further inquiries. Thank you for reply, one follow up question. When you receive Dash via whatsapp, or telegram, can you can choose via with methode you wish send it ? so for example you get dash via whatapp, but internet is not working, so now you pay via sms ? or are there limitations ? Dash Text wallets are tied to your phone number, so if you use the same whatsapp/telegram/sms number then you can access the same wallet from those 3 channels, so you can choose which method you want to send funds. If you use a different number for Telegram for example, then you would have a separate dash text wallet tied to that number, but it will work with SMS if you use that number for SMS. We will be cautious with this of course, and will be releasing details in a few weeks. YESSSSSSSSSSSSS, Strongly support, Dash will finally be usefull for unbanked, So it seem the beginning of the Evolution. Thank you so much for your comment carlomile3! Looks like a great proposal, yes from me. We both made our proposals with very little funding left, but the last thing I want is for them to be seen as competing, which is something we have sadly grown accustomed to these recent months. Your proposal seems to me very important for Dash, I obviously might be biased but I also think my proposal is very important for Dash. I've seen too much infighting in our community. I'm really hoping that they both pass, at least to show some unity. Hello quantumexplorer, we really appreciate you leaving this message, sadly due to the Dash price, monthly cycles have become a lot more competitive and we find ourselves in this situation, I haven't read your proposal fully yet but I will very soon and comment on it, I am sure is very important as well, if not you wouldn't have left this message here, thanks for voting yes and supporting our efforts! This one is an easy yes! You are doing an awesome job out there. Hello splawik21 thank you so much for your support! Definite YES! 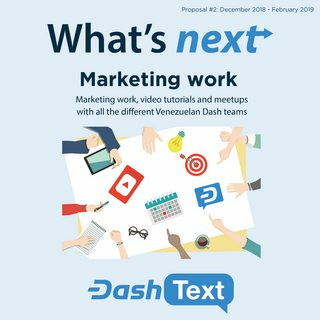 Alejandro, Lorenzo and the rest of the DashText, Dash Help and Dash Merchant team work super hard and deliver great results. They are an example for all other DASH projects. I really appreciate their regular feedback to the community through their video updates, something which I rarely see happening on many other proposals. It's been a great year in 2018 for this DASH team. I'm now looking forward to 2019 and seeing what these guys can achieve now the infrastructure for scale up is ready. Exciting stuff. Good luck guys! Hello Deepblue, as I've said in the past, you're part of this team. Your ideas and advice has helped us more than most people know. We totally agree with you, 2019 is going to be huge! Thank you so much for your continued support and counsel, we deeply and sincerely appreciate it. You guys are the rockstars of Dash, and the shining example of the kind of results the treasury system should work. Thank you, and keep it up the great work!! When I think of the other proposal owners out there that have been milking the network for hundreds of thousands of dollars worth of dash, and what they have actually delivered, it really chaps my hide. I'm happy to see more and more MNOs are finally starting to see the light and squashing these treasury parasites. Hello Unstoppable! thank you so much for your comment. It only motivates us more to keep building solutions to make people's lives easier, and spreading economic freedom through Dash, the best is about to come. Thanks for your support and the trust you put on us, we will not disappoint. A solid Yes from me, your team delivers again and again. I'm excited to see how you approach the problem of getting Dash into peoples hands. Thank you so much name3 we will keep building. And we're tackling that problem right now, Dash Text is one of the ways in which we will make it a lot easier to get Dash into people's hands, its already happening.